Revisiting Canada 100 years ago, the Bach Elgar Choir sings poignant and beautiful music from the war years. Join us on a trip back to 1918 with moving choral music from the era, combined with dramatic readings of material from McMaster University Library’s extensive WW1 archives. 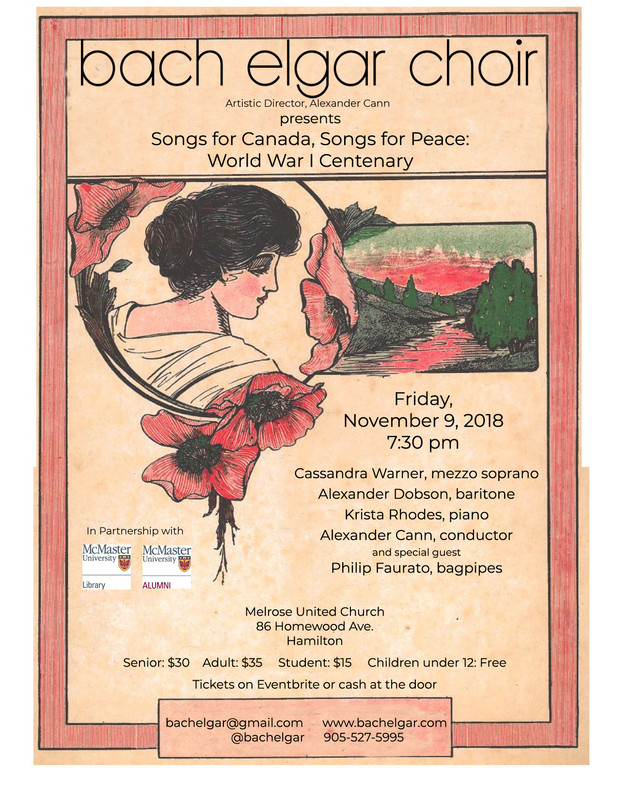 This special concert, in commemoration of the centenary of the end of WW1, features readings of letters written by Bernard Trotter, William Fingland, Marion Simpson, Charles Mitchell, Ada and Otto Hartmann, and J. Herb Gibson, as well as songs from McMaster’s sheet music collection – all among the WW1 materials housed in the Library’s William Ready Division of Archives and Research Collections. When Friday, November 9, 2018 @ 7:30 p.m. The Bach Elgar Choir has been thrilling audiences with beautiful choral music in Hamilton, Ontario, and surrounding areas since 1905. One of Canada’s longest continually operating arts organizations, the Bach Elgar Choir is a leader in the Canadian choral community. The choir presents music at the highest artistic standard, working together with world class soloists and musicians.